There was absolutely no panicking amongst the Luton players despite starting their season by going four games without a win according to striker Elliot Lee. That stat was put to bed on Tuesday night with a 2-0 success over Southend United, but Lee pointed to the level of opponents that Luton had faced so far as the reason why there was no undue concern around the squad. He said: “From inside the camp we haven’t panicked. “I know it hasn’t been a great start to the season, but we know as a League One team you’re not going to get a tougher start than we’ve had. Apart from one 45 minutes at the ABAX Stadium last weekend during a 3-1 defeat to Peterborough, Lee felt the performances levels have been right where Town want them as well, as he continued: “Portsmouth away, I think anyone who went to the game saw how good we are and we didn’t get the rub of the green that day. “Then we came back here and got a good point against Sunderland as I think anybody who finishes above them will go up. “We all know Peterborough first half wasn’t good enough, but we haven’t lost two in a row. “We bounced back, got the three points and hopefully the rub of the green is turning our way now. Netting the opening goal for the first time this term, as Lee did inside 90 seconds on Tuesday night, was a huge factor in the victory, with the former West Ham man saying: “It’s not nice, four games not getting a win, and not scoring first, as we kept conceding first. “So we put a real emphasis on getting that first goal and luckily its come two minutes in. “It’s a real boost for everyone, a real boost for the crowd,a boost for us, we’re not getting down on ourselves, it just gave us a real confidence boost and we went on from there. “It was a fantastic night for everyone, we’ve worked hard for this win, we knew it as going to be a tough night and we knew if we got off to a good start we’d give ourselves a chance. 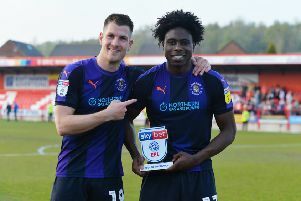 Meanwhile, Lee warned the rest of League One, there is definitely more to come from the Hatters, adding: “Listen we played really well, but we weren’t at our best on the ball.